Multiplying and other arithmetic with Feet & Inches in Excel - How to? If the metric system became an universal standard for measuring things, we all can stop worrying and go to that wooden tile store to place order now. Alas, we still have to deal with feet, inches, miles, pounds, ounces and gallons (not to mention irrational numbers like pi, e and eleventeen). Fortunately, Excel has 2 powerful features to support calculations like this. CONVERT() as the name suggests is an Excel function that can convert values from one base to another, like feet to inches, square meters to square feet, centigrade to fahrenheit, grape juice to wine. Well, not the last one, but it shines in all other scenarios. So we can use CONVERT() to first convert all the numbers to a common base like meters or inches or feet. Then perform the arithmetic. Once done, convert back to Feet & Inches. Once we have values in meters, we perform the arithmetic by simple multiplication & division. If you don’t feel so hot for the CONVERT(), then this method works for you. 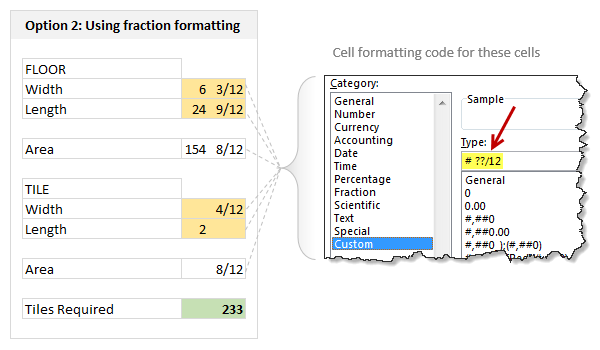 You can use fraction cell formatting to enter fractions like 6 3/12 and 24 9/12 in to cells and let Excel treat them as regular numbers when multiplying, adding or dividing. Rest of the arithmetic is simple. Here are few more scenarios where you can use either CONVERT() or fraction formatting. If varnishing 1 square feet takes 2 minutes 30 seconds, how much times does it take to finish a 20 ft 6 in x 12 ft 9 in room? If average customer call lasts 3 minutes 10 seconds and Cynthia took 400 calls in last week, how many hours did she work? If Mr. Gill Bates earns $1000 per every 1 minute 4 seconds, how many days does it take for him to earn $10 million? How many teaspoons of honey per gallon? Click here to download example workbook. It shows 3 methods for solving this problem. Examine the formulas and format settings to learn more. Do you use Excel for these kind of problems? I am not much of a carpenter. Few years ago, I decided to add a door to my office desk so that my kids (they learned how to crawl around that time) wouldn’t poke the reset button of my CPU. After buying necessary material (a wooden plank, nails, hinges, magnetic door locks) and wasting a day hammering nails in to my fingers, bending one of the hinges, almost breaking the wooden plank in to two, I gave up and closed the shelf-space completely instead (here is a pic of my carpentering disaster). So it suffices to say I do not use Excel for modeling my carpentry jobs. But I am sure many of our readers are better carpenters, masons, plumbers, knitters or cooks than me. So tell me. Do you use Excel for modeling these kind of problems? What formulas, techniques and tips do you use? Please share using comments. Now if you excuse me, I have to go look at the leaky faucet my wife is complaining about. I am sure I can ruin it with a pipe wrench. I created an Excel app to help remodeling my home. Enter room measures and the app draws a floor plan. Enter counter dimensions and counter shapes are added. Click on a room's floor and the app displays measures in feet, inches and fractions (using the fraction format discussed) of an inch. It also displays square feet. Click on a counter top and instantly know how much granite is needed. This is great when talking with contractors as well as determining "how many wooden floor boards I should buy." If anyone wants a copy of the app, just ask here and I'll provide a link. Requires XL 2010 or later. Hi Craig, we are busy doing our kitchen and an app like the one you mentioned would be great. Much appreciated. Oh, I almost forgot. 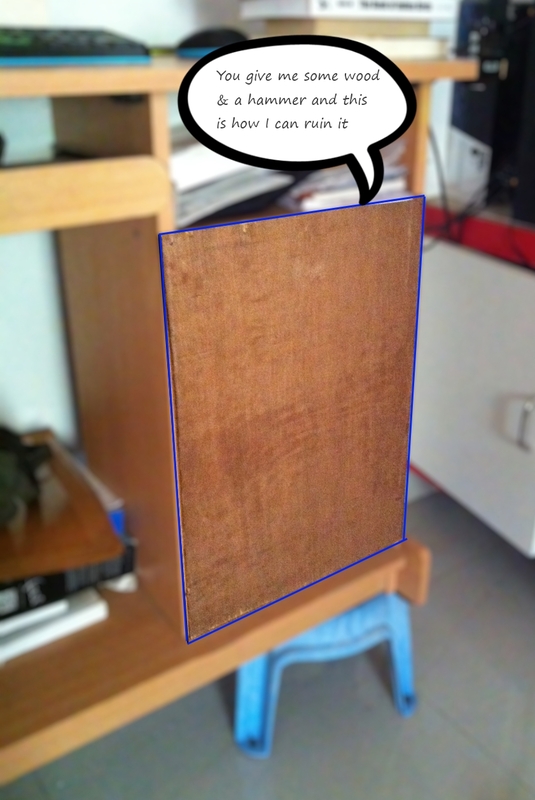 I'm using Google Sketchup for the 3D viewing. It's free. Takes about 4 hours of work to really learn it using Google's excellent video training along with practice. If you don't have 3D software, I highly recommend it. I have both the XL App and Sketchup running in different monitors. When I need to add a room to Sketchup, I click the room in the XL app, get the dimensions, and create the 3D shape. The two working together worked well for me. Please send me your app. Would you mind to upload your 'Tool'? Here is the link to my app. Please note, this is something I did for myself. It has not been battle tested and it is still being revised. It uses VBA so macros must be enabled. All VBA code is open for view and revision. An optional component is a graphic that should be loaded in the same directory as Excel workbook. I know it has been a long time but do you still have his App? The link is broken? The tiles calculation does not work this way if cut tiles cannot be used elsewhere or even if you can, the remaining piece should be more than 50% of the tile size (W or L as appropriate). So you essentially have to divide room width by width/ length of tile depending on layout and length by the other dimension. And then multiply. We have some layouts where we need to tile the rooms in staggered layout and then the number of tiles per odd and even rows could be different. @Hemant... Of course, no one wants a room full of broken tiles. In such cases, you can use below calculation. You can flip the tile dimensions to see if that is going to save you a few tiles. Look forward to seeing more out-of-the-box usages of CONVERT. CONVERT is a nice function but the example of flooring is not a good one - because, as has been mentioned there is more to coming up with the right answer than just comparing the areas. A better example, without this issue, would be painting the four walls, of varying dimensions, with space subtracted for windows and doorways and knowing the yield for a given measure of paint. Please review and update Declar statements and then mark them with the PtrSafe attribute." I am using 64 bit OS and my macros are enabled(security @ the lowest level). This is an opportunity to help each other. I've added the PtrSafe to the API declarations. I don't have a copy of 64 bit office so I can't test it. Please test it and let me know the results. I've also made some improvements to the app. So if anyone downloaded it yesterday, download it again for the newer version. "I'd have got away with it if it wasn't for those pesky kids"
Love the excel worksheet for number of tiles required. I'm not sure I understand the purpose of converting from feet+inches to feet to meters. 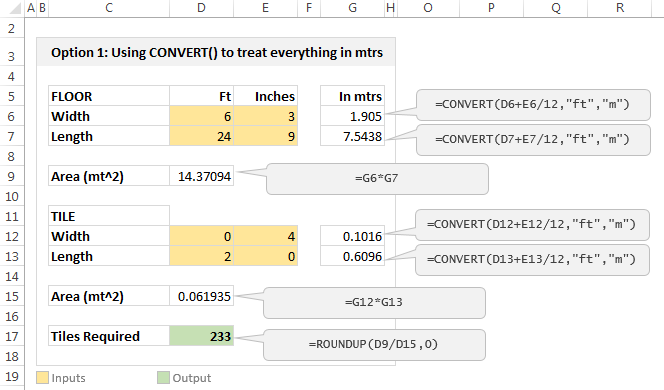 If you changed your "In mtrs" cells to "in feet" and just had the formula + /12, would not the rest of the sheet work the exact same way? Thanks for the posts. Not sure if there have been other, "simpler" methods shared, but I find this quite effective for my general contracting. Third Column; Convert Inches in Second Column, you may choose to only convert the sum of inches, but I run it down the entire column, i.e. to will convert "10" to "10/12". Could not paste a pic to show example, if you like and want example, email me and I'll send it that way. Best of luck.